ICP Spectrometry instrumentation is housed in a purpose built laboratory within the Charles E Fipke center for Innovative Research - The first laboratory building in Canada to achieve a five Green Globe rating for sustainability via the utilization of Geo-exchange technology for heating and cooling, An environmentally sustainable design that meets LEED Platinum standards. 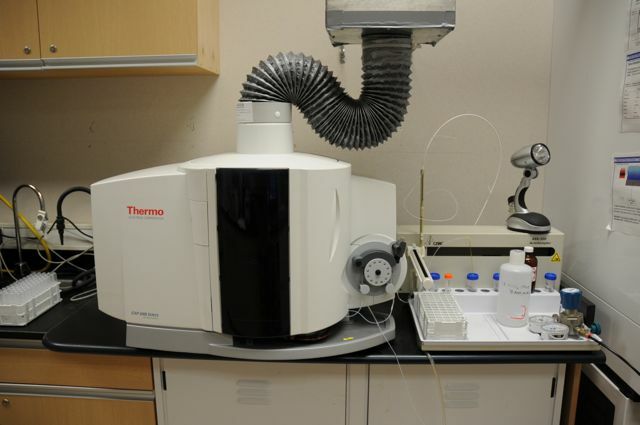 ThermoFisher iCAP 6000 ICP-AES – is used for trace element analysis of aqueous samples in the ppb to ppm concentration range. Equipped with an CETAC ASX520 autosampler. Robust and capable of high sample throughput. ThermoFisher X2 quadrupole ICP-MS – is used for trace element analysis in the ppb range of concentrations. Equipped with an CETAC ASX500 autosampler and Colission Cell Technology for the minimisation of matrix and polyatomic interferences. ThermoFisher Element XR double focusing ICP-MS – a more sensitive ICP-MS than the X2, it is also capable of resolving away most polyatomic interferences using higher mass resolution. The Element is best suited for ultra-low trace element concentrations and low volume samples. Equipped with an ESI SC-2 autosampler with enclosure. Photon Machines Analyte 193 Excimer laser – is used for laser ablation sample introduction to either of the two ICP-MS instruments. The laser delivers nanosecond pulses of 193 nm laser light that can be focused onto spots as small as 4 µm in diameter on a solid sample surface, in the process producing aerosols that are delivered to the ICP-MS. A separate computer workstation is used for post-acquisition processing of laser ablation data via Glitter software. Glitter enables the user to easily view laser ablation data and select the best portions for calculation of isotope ratios or element concentrations.